I had to read the recipe twice to decide if it was within my skill level. 🙂 I love soup but I always think I’ll screw it up. But after some chopping this looks majorly doable! Oh yes, this recipe is SUPER EASY! Those are the best kinds of recipes, right? Oh I love savory dishes with peanut butter! This soup looks delicious and I have all of the ingredients except for the Berbere spice mix. I could make this this weekend. Thanks for sharing!! 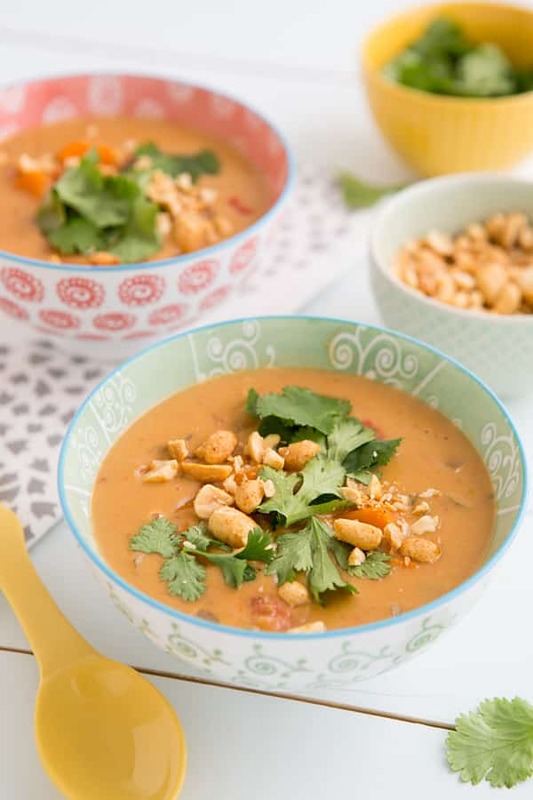 This is my kind of soup – something that’s filling enough to be a meal on its own, and the combination of peanut butter with sweet potato and spices always works for me! I also like when a soup is thick enough to hold toppings like peanuts without them disappearing down to the bottom of the bowl! I can’t wait to make this!! I LOVE making soups. Thanks so much for posting. Even the picture looks fragrant! I need more soup recipes in my repertoire during the winter months. 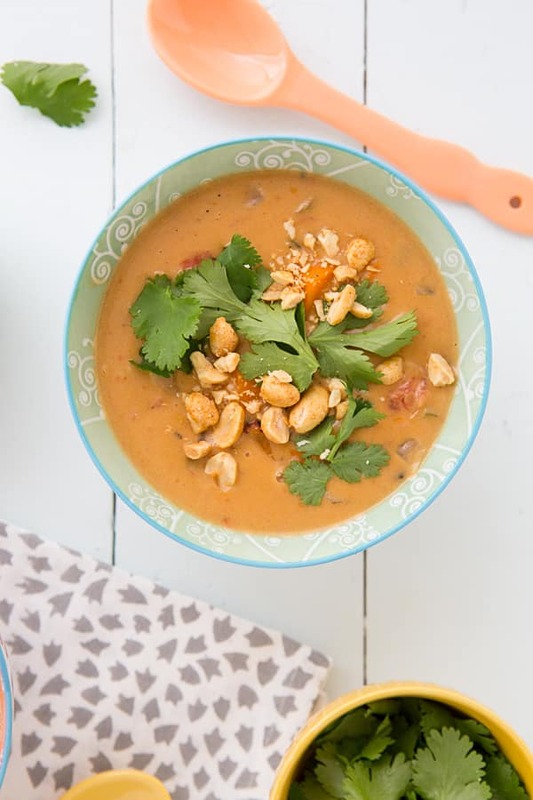 Ooh I remember the first time I saw peanut soup and it looked irresistible!! I am in love with the fact that this uses peanut butter AND sweet potatoes in the base! And I had to laugh at the first line of your post because I was trying so hard to remember what I ate for lunch yesterday…but of course I could remember exactly what I put in the banana cake I made last week. Thanks, brain. Our brains betray us! I totally remember the most bizarre things, but important things like pin numbers and passwords, nope. Why does that happen?! This was really good. My husband loved it. I found a recipe to make my own Berbere spice mix. I can’t wait to have leftovers!!! I assumed this was a blended soup but I didn’t see that anywhere in the instructions. Checking to make sure you’re not supposed to blend it to make it creamy. It’s creamy from the coconut milk and peanut butter; it doesn’t need to be blended. 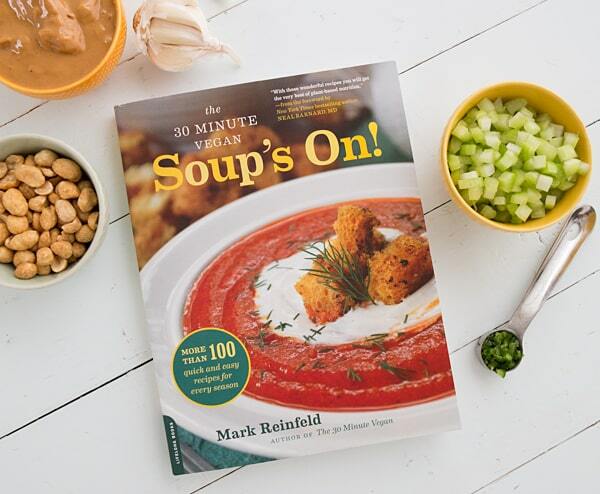 Just looking over the recipe and pictures of the soup…it looks amazing! Can’t wait to try it! Thank you–I hope you like it! No, it’s not meant to be a pureed soup; there are pieces of sweet potatoes and tomatoes in it. I love this recipe! I’ve blended it and just left it a little chunky and both are great! Wonderful and easy recipe! This soup was delicious!!! I had to cook it longer because the sweet potatoes were taking a while but it was worth it. I added coriander and left out the celery. Even my non-vegan parents loved it! This is definitely a must-make! Delicious! Now a family favorite. Thanks so much! Looks super tasty and comforting! Yum! Goodness…this sounds insanely comforting! With this crazy cold weather we’re having, I will be sure to give this a try! Thanks! This looks so comforting and delicious! Totally my kind of soup! Mmm mmm mmm can’t wait to make this heart warming soup. I can just imagine the warmth from the heat and the silkiness from the coconut milk and peanuts gliding down my tongue and throat. Any thoughts on using a powdered peanut butter to ease up on the fat calories? I bought a jar, but I haven’t used it yet. I use powdered peanut butter in smoothies, but I’ve never cooked with it. My guess would be that it would work, but the soup would be a little thinner. If you try it, let me know how it turns out! Did you use regular peanut butter for this or the natural, unsweetened, non-hydrogenated peanut butter? I used the natural stuff and felt like my soup lacked a little sweetness. Will try with regular peanut butter next time. This is amazing! Enjoying a bowl of it now.